After 6+ years at Oracle, I have decided to move on to new ventures. Thanks for reading the blog, your comments, and the feedback you provided over the years. I will be working at Terracotta (a wholly owned subsidiary of Software AG) on in-memory data management products. Wishing you all the best and success with the Oracle WebCenter product. 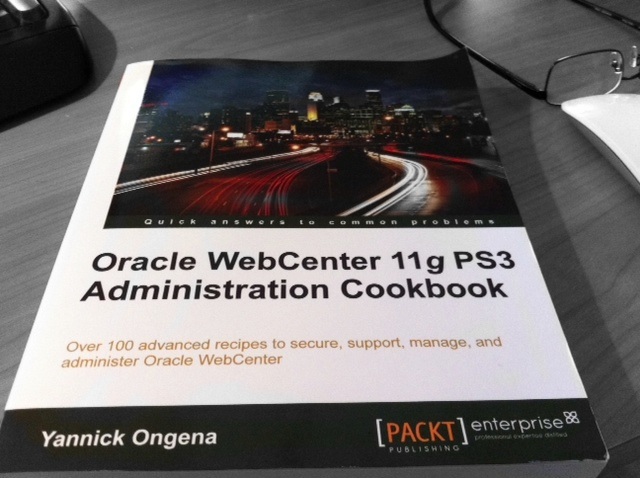 I received a copy of Yannick Ongena’s “Oracle WebCenter 11g PS3 Administration Cookbook” from Packt Publishing a few weeks back. Here is my assessment of the book. While the title “Administration Cookbook” suggests that it may just cover Administration topics, I found the book covering a lot more than just Administration. It covers all the important aspects of WebCenter Portal – building a portal, consumption of Portlets, constructs like Navigation and Page Templates, services like wiki, Spaces, and much more. Yannick’s book is very well written. The concepts are very well laid out and explained with a lot of screen shots. The book is a great resource for Architects and Developers. It provides an excellent overview and will be a good reading for Project Managers who are evaluating Oracle WebCenter Portal. I really like the way Yannick explains how a Portal can be built using the powerful JDeveloper tools and later evolved and managed using WebCenter Runtime browser-based tools. Congratulations Yannick on bringing this book to the ever growing WebCenter community! An (ADF) Taskflow is a self-contained rendition with its own navigation control and mechanism to execute business logic along the way. In ADF applications like WebCenter Portal, taskflows are heavily used. e.g. each WebCenter Portal service has one or more taskflows available out-of-the-box. Refer to this excellent overview by my colleague, Frank Nimphius on his blog. A Portlet, as you may all know, is similar to a taskflow in function. The main difference being that they run remotely in a “portlet container”. WebCenter supports both portlet standards – JSR 168 & JSR 286. Via Oracle WebCenter’s JSF Portlet Bridge, one can also expose ADF Taskflows as a Portlets. This capability is based on JSR 301 & JSR 329 standard and is very widely used. Having both these options means that you have to make a decision on what to pick when you are building components for your Enterprise Portal. There are various aspects to consider including deployment model, customizability, running remotely, availability of Application Context, eventing, etc. I am curious to hear some of your experiences with these two technologies we provide when building your WebCenter Portal(s). Thanks all for attending my session on WebCenter Portal Security. The slides are here. We published a White Paper today on OTN describing how you can make your Portal’s skin available to the Portlet Producer hosting the portlets. This will allow your Portal users to have a seamless UI experience. 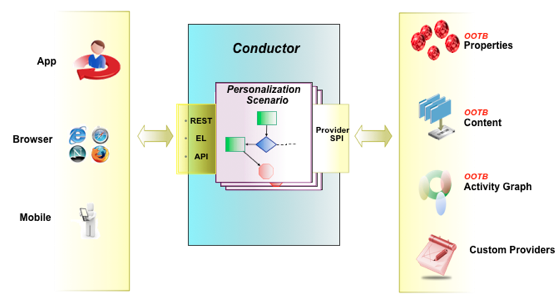 The WebCenter Personalization server team has a great blog here. It has a great sample (with source code) that shows how one can leverage the Property Service. Check it out! If you missed the announcement, here is the link to the new Virtual Machine that is now available on OTN. Please refer to the “Setup Instructions” on how to download Oracle VM VirtualBox, download the bits, and start the VM. This VM consists of a sample that highlights an intranet site (“AviTrust Employee Portal”) built using Spaces. Once your VM is up, go to http://host:port/webcenter/spaces/avitrust, log in, and check out the various customizations including new page template (using flyout menus), skin, and custom language taskflow. There are some nice patterns on how you can model a portal site with collaboration features using WebCenter Spaces. ps: Post your questions to this forum if you have any issues.